I have to admit to being biased when I first watched Leighton Vander Esch. His name sounded like a character from Gossip Girl and at first glance he looked like so many other pedestrian linebackers the Packers have trotted out in the past dozen years (A.J. Hawk, Brandon Chillar, Jake Ryan, Kyler Fackrell, etc.). It took me all of 20 plays to realize the former Boise State star was nothing like those players. It took me just a little longer to realize he’d be well worth the 14th pick. Vander Esch is the No. 6 non-QB on my final board, behind only Penn State running back Saquon Barkley, Notre Dame guard Quenton Nelson, North Carolina State defensive end Bradley Chubb, Ohio State cornerback Denzel Ward and Georgia linebacker Roquan Smith. Yes, that means I like him better than Alabama cornerback Minkah Fitzpatrick, Florida State safety Derwin James, Washington defensive tackle Vita Vea, Virginia Tech linebacker Terrell Edmunds, Texas-San Antonio defensive end Marcus Davenport and Alabama wide receiver Calvin Ridley. Hey, I’m just as surprised as you are. 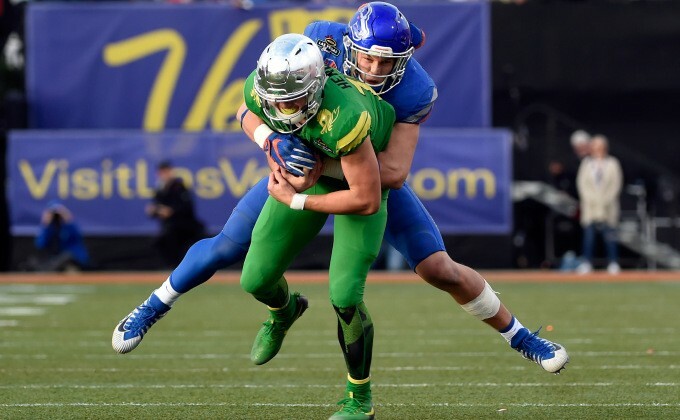 What makes the 22-year-old Vander Esch so appealing is his athleticism and his versatility. He may look like Chiller or Fackrell when he walks onto the field, but he moves better than any Green Bay linebacker in the past two decades, including six-time Pro Bowler Clay Matthews. In fact, Vander Esch’s hips are more fluid and his change of direction skills are more impressive than any cornerback or safety on the current roster. 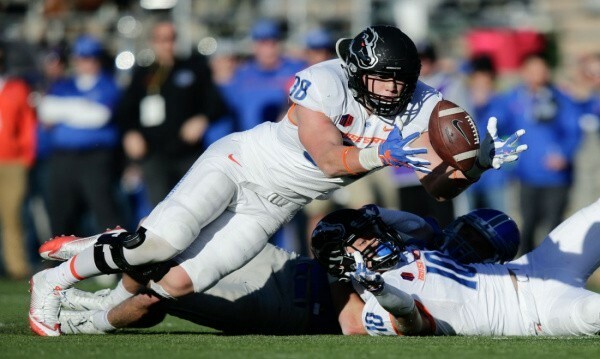 How versatile is Vander Esch? He has the physical ability to blitz up the middle, stay with tight ends and running backs in coverage and rush off the edge – something that might not become fully realized until he gets a little bigger and stronger. That can also apply to his play against the run, although lining up behind stud tackles Mike Daniels, Kenny Clark and Muhammad Wilkerson would be a tremendous help next season. 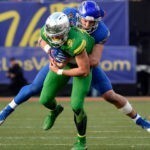 Here are three videos that show some of Vander Esch’s strengths as a player. In the first, watch how much ground is covered as he tackles Washington State halfback James Williams after only a 1-yard gain. In the second, his timing, tenacity and explosiveness are all on display as he sacks Washington State quarterback Tyler Hilinsky for a 20-yard loss. In the third, his instincts and ball skills allow him to seal the Mountain West Championship with an interception against Fresno State quarterback Marcus McMaryion. To be honest, it’s really hard to find a reason not to like Vander Esch. In addition to his terrific physical ability, he’s an incredibly hard worker – both on and off the field. Plus, he’s nowhere close to reaching his potential as a linebacker. It’s important to remember that he played 8-on-8 football in high school in Idaho and started only 30 games in college. With quality pro coaching, there’s no telling how much better he can be. Vander Esch would start right away for the Packers, probably next to tackling machine Blake Martinez at inside linebacker on early downs. In the nickel and dime packages, he would provide the type of coverage that hasn’t been seen from a Green Bay linebacker this century. He’s big enough to jam Minnesota’s Kyle Rudolph at the line of scrimmage, athletic enough to stay with Chicago’s Trey Burton over the middle and fluid enough to cover Detroit’s Theo Riddick in the flat. There aren’t many players on the planet capable of that trifecta. I understand that Vander Esch isn’t the explosive edge rusher or the No. 1 cornerback the defense so desperately needs, but neither are Edmunds, James, Smith or Vea – four players most people would love new general manager Brian Gutekunst to select with the 14th pick. The goal should be to take the very best player in round 1, and barring a trade up or an unexpected fall by Ward, that player will be Vander Esch. Could Gutekunst trade down and still get Vander Esch? Perhaps, but not too far. While he often falls into the mid to late 20s in mock drafts, general managers in the National Football League are a lot smarter than the “experts” who give their opinions in papers and on television. Even in a draft with so many quarterbacks expected to go early, I just don’t see how a player as talented as Vander Esch gets out of the teens.